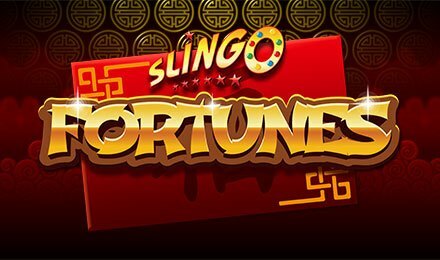 Slingo Fortunes | Top Games | Register @ Vegas Spins! Immerse yourself into bright colours on Slingo Fortunes at Vegas Spins! Beautifully crafted by Gaming Realms, it is an instant-win game which combines the excitement of both slots and bingo. The beautiful colours hint at an Asian theme, right? The game is indeed based on a Chinese theme involving lucky red envelopes. It consists of a 5x5 grid filled with 26 such envelopes. Your goal is to spin the reel and match its numbers with those found in the envelopes above. Create Slingos horizontally, vertically or diagonally. Get a taste of this game on a desktop or mobile device at Vegas Spins! You must be looking forward to the gameplay! Get started on Slingo Fortunes by clicking on the + and – buttons to adjust your bet. By clicking on the Spin tab, you can begin with the game. You are first offered 10 spins. When these are played through, you can purchase additional ones or use the free spins won during the game. On each spin, 5 numbers show up on the reel, with one for each column. If the number on the reel matches the one on the envelope above, its prize amount is revealed and removed from the grid. On Slingo Fortunes, your objective is to create a Slingo by opening 5 envelopes in a row horizontally, diagonally or vertically. In this way, you can climb up the prize multiplier ladder by one step. Achieve 5 or more Slingos to see your prize multiplier increasing by 1x per Slingo, which can go up to 7x! Get 4 Slingos to trigger another prize on offer depending on the remaining values in the game. Clicking on “Accept” to take the offer ends the round. You can also “Reject” it to keep on playing for higher payouts. Bet Levels: Bet levels are absent on Slingo Fortunes. Amount of Paylines Selection: The game does not consist of paylines. Coin Values: The various stake values range from £1.00 to £100.00. If you are looking for some free spins, simply get the “Free Spin” symbol on the reels to earn an additional one at the end of the round on Slingo Fortunes. Have you seen the smiling Joker? Here, this symbol acts as Wild and opens any envelope in the column in which it appears. Find Wild Super Jokers as well on Slingo Fortunes! They open any envelope on the entire grid. Look out for the Devil icon on the reel as its function is to block any potential matches on the grid. Thus, it adds some spice to your gameplay! Revel in a fun-filled and unique gameplay on Slingo Fortunes at Vegas Spins and plunge into the authentic Asian atmosphere. Good luck to you!